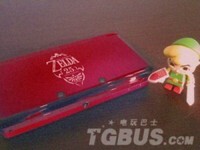 Apparently this image, which I picked up from GoNintendo (who in turn seemed to have picked it up from the Chinese site TGBus) is supposed to show the “official” limited edition Zelda 25th anniversary 3DS model – but frankly I don’t buy it. That such an offer would use the official Zelda 25th anniversary logo wouldn’t surprise me, but there isn’t much else about this particular design that strikes me as the real deal. First of all, while Mario‘s 25th anniversary came with red-colored versions of the Wii and DSi, the color doesn’t mean very much for the Zelda series. Limited edition releases for the fantasy adventure/action-RPG have usually come in gold, so we could expect the limited edition 3DS that will inevitably come to be would be gold also. I suppose if you really stretch it you could say that the usual logo for the series is red, but even then it seems like Nintendo would want to make some kind of Zelda merchandise after the distinct Zelda pattern. Second of all, while it’s plausible that something like this would include the anniversary logo, it’s more likely that it’ll use its own unique branding: the icon for the Ocarina of Time, perhaps? The Triforce mark? A simple Hylian crest? Then again, it would be just like Nintendo to slap a simple logo on something, release it in limited supply, and call it fanservice. I think the one that clinches it for me is that Nintendo hasn’t said a word yet in any of its major territories. While I wouldn’t expect something like this to show up first on Zelda.com, for instance, I imagine we’d at least hear from retailers or perhaps a press release if something this big were already in production. But, of course, I have no positive way of knowing whether or not this is real other than my own experience, so let me ask you guys: do you think this is the real official limited edition anniversary 3DS? Or is it just another fake?